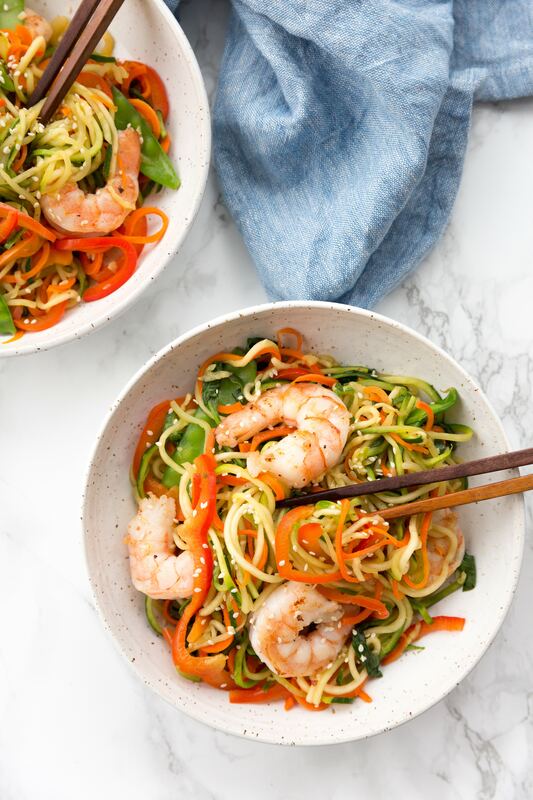 This spiralized, veggie-packed noodle bowl is a healthier, lower carb version of a classic Chinese takeout dish: lo-mein! 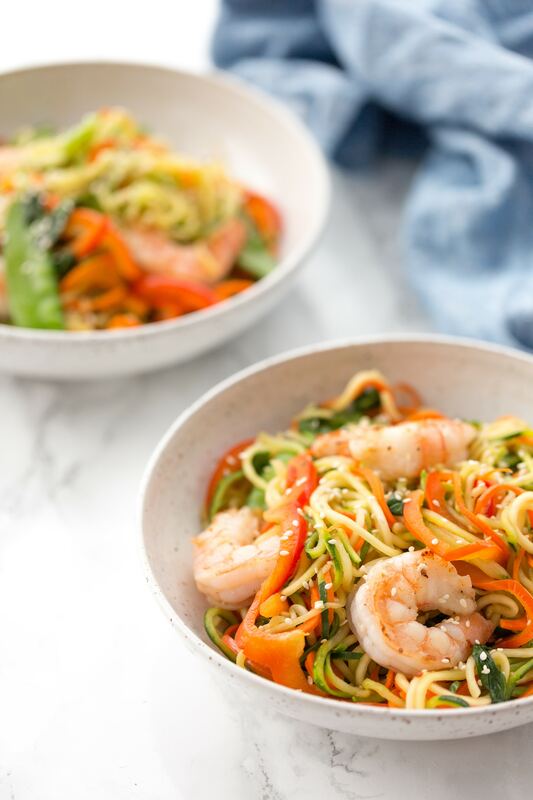 Shrimp, zucchini noodles, spiralized bell peppers and carrots make for a delicious and healthy meal that comes together in under 30 minutes! If you’ve ever ordered lo-mein for takeout before, you’ve probably ate too much and felt over-full and lethargic afterwards. It’s so good, it’s hard not to have a second helping. Personally, I hate that feeling – it’s not about the calories or carbs, it’s about how I feel. I feel gross after! I’ve found a trick: order proteins and veggies in whatever sauce you like and while you wait for your order to arrive, spiralizing your veggies. 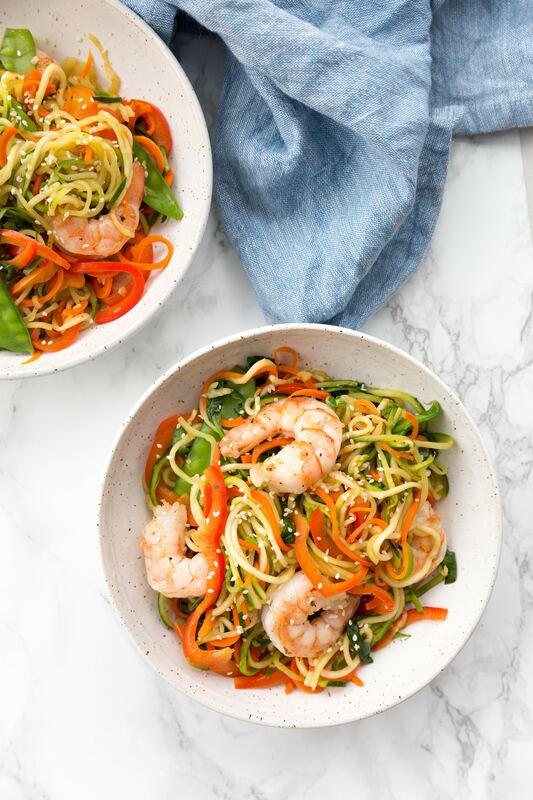 Once the food arrives, toss the spiralized noodles with the protein and veggies and voila – a healthier, still delicious version! OR, if you’re truly committed to saving money, cooking at home, and eating clean, make your own versions! I love Asian food – Thai (fell in love with Kao Soi Gai while in Chiang Mai a couple years ago and had to remake it), Chinese (sweet potato fried rice all the way! ), or a Vietnamese pho (with zucchini noodles! 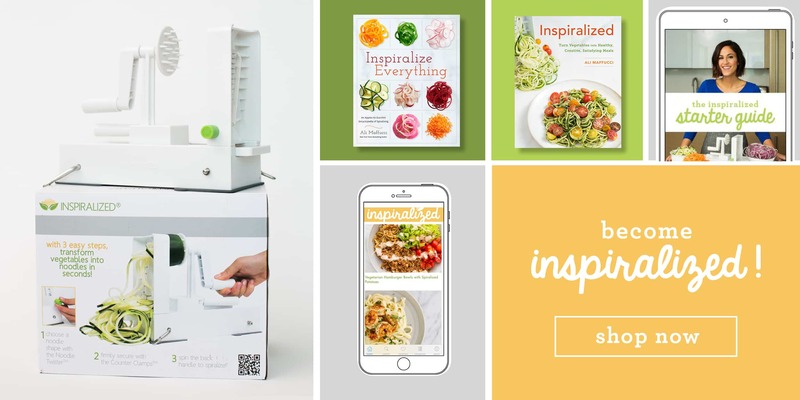 ), I’m always making #inspiralized versions. Lo mein is one that I love to recreate. I’ve done a Pork Lo Mein. A Chicken Lo Mein. A Vegetable Lo Mein. And now, we have a Shrimp Lo Mein! Do you think I like Lo Mein? This Shrimp Lo Mein comes together in under 30 minutes, is filling, veggie packed, and certainly satisfies those takeout cravings! Today I’m partnering up with the team at The F Factor Diet (if you missed my post on how they changed my postpartum health journey by discovering the importance of fiber in your diet, read it here) to share two fiber-filled meals aka #ffactorapproved! You can grab the other recipe for Vegetable Cabbage Pad Thai on their blog right now! Both of these meals are high in fiber and high in protein, keeping you fuller longer and most importantly, satisfying your cravings! Heat the sesame oil in a wok or large skillet over medium-high heat. Once oil is shimmering, add the shrimp, season with salt and pepper, and cook for 2 minutes, flip, and cook another 1-2 minutes or until shrimp is opaque and C-shaped. After the shrimp is done, set it aside on a plate and cover to keep warm. Immediately add garlic and ginger to the pan and stir for 30 seconds or until fragrant. Add the spiralized vegetables, and snow peas, to the same skillet and cook, tossing frequently, until tender, about 7 minutes. When done, add the spinach and toss for 2-3 minutes or until wilted. Meanwhile, prepare the sauce. In a small bowl, whisk together soy sauce, honey, sesame oil, and pepper. Once vegetables are done cooking, add the shrimp back in and pour over the sauce and toss to coat the vegetables and shrimp in the sauce. Let cook for 30 seconds to warm through. Divide the lo-mein into bowls, garnish with sesame seeds and serve immediately.